Tonight was one of those nights. I was tired after work and uninspired to cook/shop or even deal with food at all. I knew we had some leftovers, boiled baby potatoes and string beans along with a side of grilled asparagus (some gorgeous early spring ones) but we had eaten the fish portion of the dinner last night. A small round white light bulb went off. Eggs! After contemplating making a quiche (too much work for the mood I was in) I just heated the pile of leftovers up in one big pan and served them with light fluffy scrambled eggs with some herbs and a splash of milk (all cooked in the same pan…less to wash). A bit odd for dinner at first, but then I put some French music on and savored in the time dinner didn’t take to make. Literally 10 minutes to heat up and scramble. Eggs aren’t just for breakfast! They are a great source of protein (~6g per egg or about 10% of your daily needs) as well as vitamins A, D and B12, the carotenoids lutein and zeaxanthin (antioxidants) and the nutrient choline. They last a while in the fridge (2-3 weeks at least) and take very little time to cook. Of course there is the cholesterol thing (an egg contains ~ 215 milligrams of cholesterol) but I tell my clients not to be afraid of eggs since the cholesterol is still under the recommendation of <300mg/day). 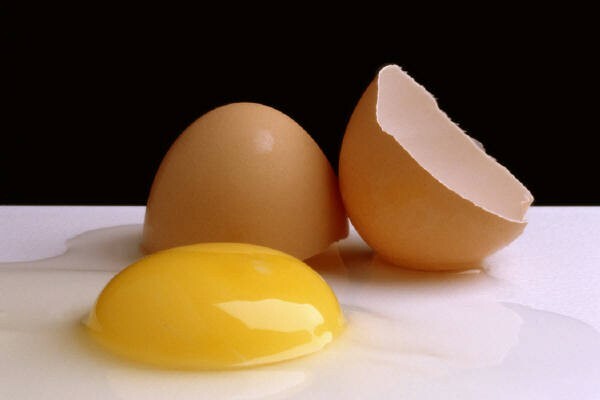 If you are watching your weight, you could do the egg white thing and get all the protein without the ~5 grams of fat contained in an egg yolk. A large egg is 70 calories. And by the way, don’t get too overwhelmed in the egg section. While you can choose organic, fertile, free-range, different sizes and brown or white, there is no nutritional differences between them.